The train system. It's much more complicated than you think, and not just because of the many lines and routes. How you interact with others on the train and in the station is much different than in New York or London. Here are some of the do’s and don’ts I’ve learned when it comes to taking the trains. Overall, these generalized statements are from a foreigner’s perspective that aim to teach others how to be as polite as possible while being a foreigner in Japan. 1. NO EATING on the train. Especially as a foreigner. It’s considered rude and unsanitary not only because of the waste but also the smell. Some elderly folk might whip out a snack from time to time because they seem to have more social freedom than other generations, but otherwise, hardly anyone eats on the trains. 2. NO TALKING on the train. Well, you can talk, but I’ve noticed many foreigners talk loudly on the train and get shushed, then try to talk softer and still get shushed. Foreigners tend to talk loud even when they’re consciously trying to talk soft, so always be aware of your volume. If you can only hear yourself and your group of friends on the train, that means everyone else probably can, too. 3. NO PHONE CALLS on the train. If someone's phone rings on the train, they almost always whispers that they’re on the train into the speaker and promptly hang up, or they don’t pick up at all and scramble to turn off the ringtone. Texting is fine, and headphones are, too. On a similar note—make sure your music isn’t playing through your headphones. You'll get some serious dagger-eyes sent in your direction. 4. NO CROWDING around waiting lines. Look for painted lines on the platform ground. Those lines show you where to stand and wait so that everyone can line up single file. Keep in mind that once the train rolls up to the tracks, everyone in the single file lines will walk forward and line up on either side of the doors; not in front of them. This way those exiting the train can step out without bumping into other waiting people. 5. BUY A PREPAID CARD. Don’t try to buy tickets. Hardly anyone uses tickets unless they’re going on a longer trip because they’re a hassle. Buying a prepaid card, similar to a MetroCard, is simple in Japan. 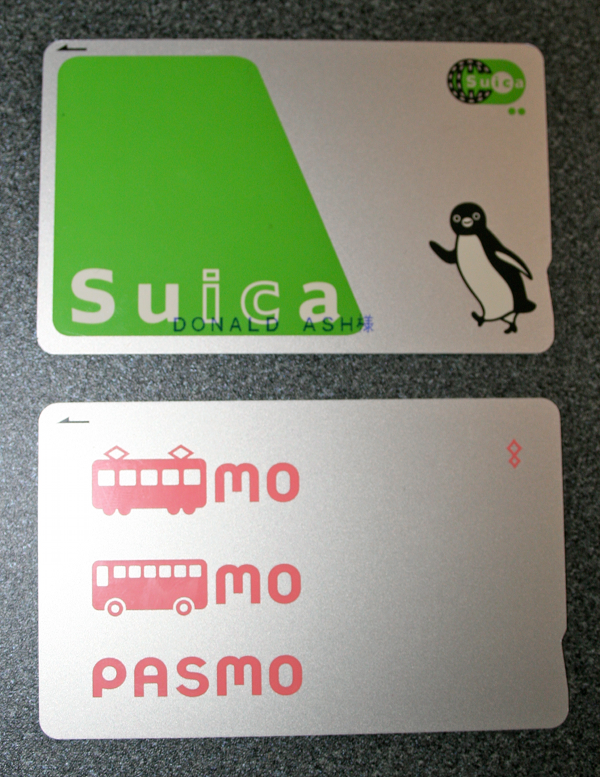 There are kiosk machines on the station walls that either say Pasmo (pink logo) or Suica (green logo with a penguin). Both brands work equally well. Pay a five-hundred yen deposit for the card itself, whatever money you want to put on the card for travel, and then you're finished. If you return the card to a station attendant after the course of your stay, you will receive the five-hundred yen deposit back. You can select the machine menu to speak in English, too, so purchasing a prepaid card this way is convenient for foreigners. You use the card by swiping it over the oval scanners found on barricaded gates that lead toward whatever line you’re taking. 6. REMEMBER YOUR LAST TRAIN. Some last trains are at 11:30PM and others are at 1AM, and these times are changing every day. Google Maps is your best friend. You can search for your last train by manually setting your arrival time to LAST. If you miss your last train, you’ll need to wait until sometime around 5AM for your first train. Why can’t you take a taxi or a Lyft? Taxis are expensive, sometimes as much as 4000 yen for ten minutes worth of driving, and Lyfts don’t exist in Japan. Uber exists, but it’s rare, and more expensive. I’ve had plenty of first train nights—always be prepared in case the same happens to you!